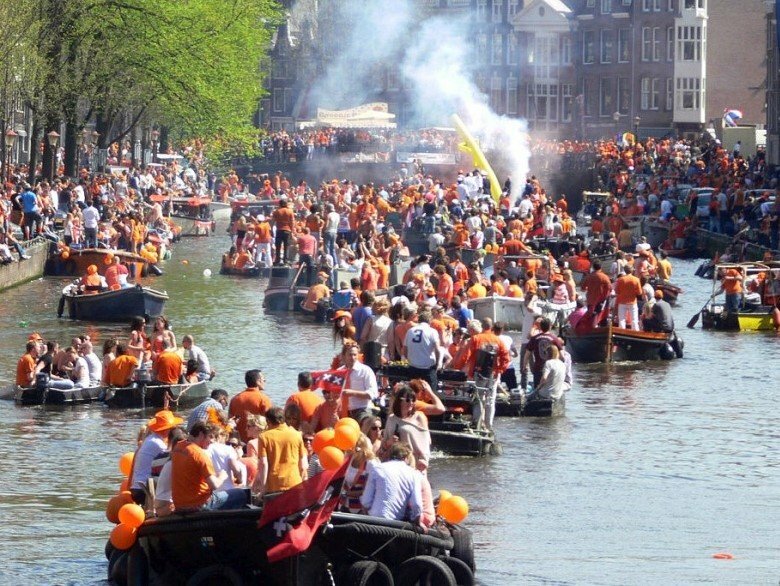 Kingsday 2019: Rent Boat & Celebrate Kingsday on the Canals! RENT A BOAT FOR KINGSDAY, THE NUMBER ONE PARTY IN AMSTERDAM! On Kingsday the whole city center is full of people celebrating. And the canals are definitely no exception to that. A wide range of boats gather to make a huge party, slowly moving from one party spot to another. Both on the shore and on the boats you will find live music, DJ’s, food and drinks. A great way to join the festivities is to rent your own boat. HOW DOES A KINGSDAY BOAT RENTAL WORK? You will experience the unique atmosphere of the canals and you can go places without having to walk the crowded streets. Likely, you will get stuck every now and then at the most popular canals. Our advice: just enjoy, go with the flow and don’t worry too much about time. Obviously, this only works with full day rentals. The time slot for picking up your boat is from 9.00 to 11.00 hrs. and we expect you to return your boat between 17.00 and 19.00 hrs. As always, there is a maximum of six people per boat, due to license and insurance. HOW TO BOOK YOUR KINGSDAY BOAT RENTAL? The rate for this full day rental on Kingsday is € 300,-. This is all-in and the best you will find in Amsterdam. For booking your boat rental for Kingsday please use our easy online booking tool. Looking forward to welcoming you on Kingsday! RENT A BOAT FOR KINGSDAY, THE PARTY OF THE YEAR! On Kingsday Amsterdam is full of celebrating people. The canals are no exception to that. A wide range of boats gather to make a huge party, slowly moving from one party spot to another. On your way you will find live music, DJ’s, food and drinks. A great way to join the festivities is to rent your own boat. HOW DOES A BOAT RENTAL ON KINGSDAY WORK? You will experience a truly unique atmosphere and you can go places without having to walk the crowded streets. Likely, at the most popular canals you will get stuck every now and then. Just enjoy, go with the flow and don’t worry too much about time. Obviously, this only works with full day rentals. You can pick up your boat between 9 and 11 AM and we expect you to return between 5 and 7 PM. As always, there is a maximum of six people per boat. HOW TO RENT YOUR BOAT FOR KINGSDAY? The rate for the full Kingsday rental is € 300,-. This rate is all-in and the best you will find in Amsterdam. Please use our easy online tool to make your booking. Looking forward to welcoming you!